A woman accused of setting fires to the U. S. Post Office in Big Arm and other public facilities in Montana has been denied a bond reduction. Jennifer Len Alice Cassidy, 25, appeared before District Judge Deborah “Kim” Christopher in Polson for two counts of felony arson on Jan. 10. The hearing focused on her mental health. She has not yet entered a plea to the charges. She has been incarcerated since her arrest on July 5, 2018, with bail set at $25,000 on each count. 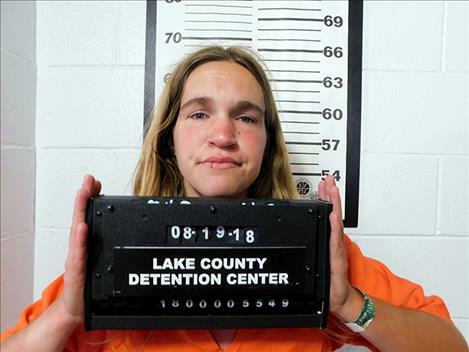 Cassidy is accused of intentionally setting fires to the restroom facilities at the rest stops along both sides of U. S. Highway 93 about three miles south of St. Ignatius on June 30, 2017. According to court records, she called the fires in herself. She is also accused of intentionally setting a fire along Highway 35 near mile marker 17 on July 25, 2017. She self-reported this fire as well. Video surveillance placed her at fires that appear to have been intentionally set at rest stops along Interstate 90 near Butte, Bearmouth and Bozeman. An anonymous third party provided information to law enforcement stating that Cassidy confessed to setting many of these fires. When questioned by investigators, Cassidy admitted to setting the fires, including the fire at the U. S. Post Office in Big Arm that caused significant damage on Jan. 9, 2018. During the bond reduction hearing, the state and defense made arguments for obtaining independent opinions from experts in the field of fitness to proceed regarding mental health. Cassidy’s public defender, Jeremie Marrow, argued that conditions at the Lake County Jail are not adequate for a person with mental health issues at Cassidy’s level. He also argued that his client would be better served under the supervision of her father, who could help ensure she is taking her proper medications and not posing a risk to herself or others. Marrow also argued that his client has already been incarcerated for five months. Christopher recognized the backlog for mental health screening at the State Hospital in Warm Springs and suggested an order forcing state officials to appear in court to explain the backlog. Marrow responded that an order forcing legislators to appear might be more appropriate. The matter was set for a status conference on Jan 31. The case is set for trial on April 22 with an omnibus hearing set for March 14.